The principle of ducted fans is well understood now. They require a duct with correct tapering at each end and a low drag but powerful engine at its core. Multiple-bladed propellers, or a fan as on a modern high-bypass turbofan are needed for efficiency. Placing a Tiger Moth engine inside a fat tube doesn't cut it. 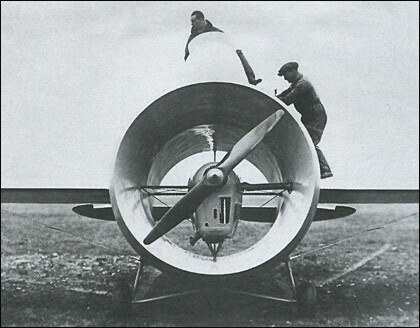 An Italian government engineer, Luigi Stipa, convinced the Caproni Company to build an aircraft to test his theory that a tubular fuselage gave significant extra thrust to a conventional engine and propeller. The resulting Caproni-Stipa aircraft had a corpulent annular fuselage, which concealed a Gipsy engine and two-bladed propeller. All this achieved was high drag and low noise, although the landing speed was reduced to 68km/h. Performance was otherwise lower than a conventional airframe with the same powerplant. Digno de admirar... Yo construyo y vuelo aviones RC, y estos son los modelos que prefiero en honor a los pioneros de la aviacion y como tributo a su obra ademas de la curiosidad por comprobar sus logros.Ya construi y vole un Burnelli cpy3 (donde el fuselaje ayuda a la sustentacion, que genios!!!!) por eso mi siguiente proyecto sera este precioso avion. Felicitaciones. � Stipa claimed that the outer fuselage was profiled to generate lift. It was said that this contributed 37% of the total. � The Stipa's pilot and passenger had to sit in cockpits perched atop the fuselage. An inherent flaw in the design is that there is little room for any payload. � Humped surfaces around the cockpits would have seriously impeded the view of pilot and passenger unless they leaned to one side, which would have been essential during take-off and landing.